Today I returned from a week of silent films, alternated with many talks with old and new friends and colleagues, initially in a cold and wet and gradually a sunnier Pordenone. The 34th edition of Le Giornate del Cinema Muto was a special edition to me, as I curated the special programme Italian Muscle in Germany, on the German films with the Italian acrobatic and muscular adventure film heroes Luciano Albertini and Carlo Aldini. Unintended, several relations sprang up with other films and programmes, as attending critics also remarked. 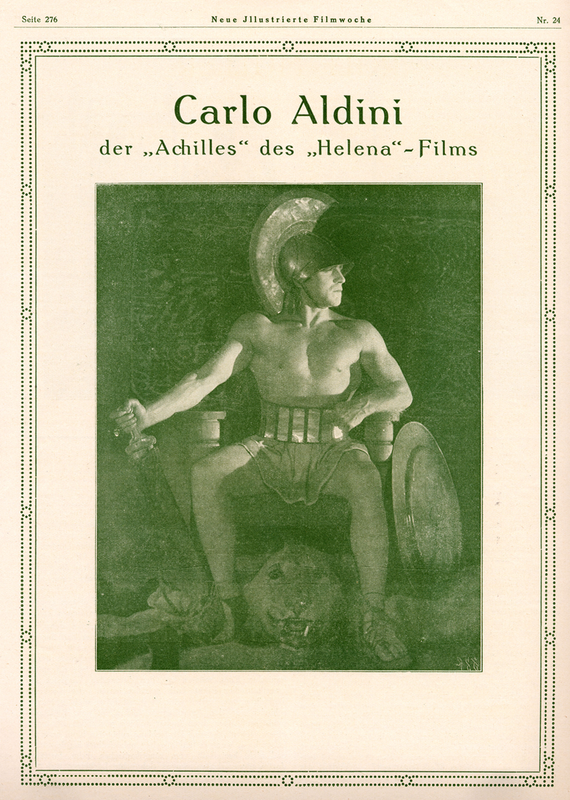 The opening night film Maciste alpino (Luigi Romano Borgnetto 1916) became a frame of reference to situate and compare Aldini and Albertini, who are often themselves not the go-between between lovers as Maciste mostly is, but are the romantic lovers (sometimes husbands) themselves. The rather course behaviour of Maciste in Maciste alpino, not only explainable because of the context of war propaganda, but also linked to the typology of Maciste (see Jacqueline Reich’s new and intriguing study on Maciste, which was presented by the author in Pordenone). In addition, the many Douglas Fairbanks films in programme in Pordenone, with their focus on superhuman jumps, noble hearts and fast pace rhythm, were not too far off from a late Albertini film like Der Unüberwindliche, indicating that this genre of acrobatic heroes was truly international and had only modifications per type or nation. Instead the shift between silent and sound film was for both Fairbanks in the US and Aldini and Albertini Europe devastating, killing off their types and so their careers. On top, while Aldini was in his thirties when acting in Germany, Albertini was already in his forties. In his last silent films he was already 50. Tragic was the downfall of Albertini when sound set in – alcohol wrecked his body and mind, as is well visible in his first and only sound film Im Kampf mit der Unterwelt. Instead Ernst Verebes, the man who had been his – incredibly funny- sidekick in his last silent film Der Jagd nach der Million – became the protagonist in Im Kampf mit der Unterwelt (of which only two French spoken, unrestored nitrate prints exist, alas). We do hope to show Jagd nach der Million next year in Pordenone, though. Der Unüberwindliche. Courtesy Bundesarchiv, Berlin. Italian Muscle in Germany started out Saturday with Nunzio Malasomma’s Mister Radio, for which a newly restored print from the Austrian Filmmuseum was used, which had been preserved by Immagine Ritrovata in Bologna (the shots in tinting & toning were nicely saved). While the plot is quite unimportant, apart form the radio craze of the 1920s, and the acting is not always well, the stunts kept the Pordenone in awe: how can you save your mother dangling on a cliff when you are yourself tied to a tree? A huge applause was the hero’s reward for his last minute rescue by use of the tree and even his own teeth. Also previous stunts flabbergasted the spectators. Mauro Colombis’s piano accompaniment greatly helped in the audience’s emotional identification with the film. On Sunday afternoon, it was the turn for the escapologist Silvio Spaventa (Albertini) and the b&w print of Der Unüberwindliche (It. title Il globo infuocato, Max Obal 1928). It was the treat of the day, not only because of the film but also because of the live music by the Pordenone Zerorchestra, conducted by Günter Buchwald, who had also arranged the music. While a two hour film, thanks to the upbeat music and well-chosen themes, you absolutely forgot time with this swift circus film, with its sensational act, in which the fierce audience reactions on the screen seemed to invite likewise reactions from the Verdi attendants. The avant-garde-like use of text and stroboscopic effects at the start of the film (this must have been the supposed contribution by Oskar Fischinger), but also the funny constant use of the legs of the circus girls made this a clear example of a combination of genre cinema (comedy, crime, adventure) with artistic cinematography (extreme camera angles, uses of close ups, importance of editing for creating meaning). In addition to plain intertitles, the film uses a kind of TV texts during the circus act, explaining the act, and taglines on an outdoors public message board, informing the masses about Spaventa’s arrest. Repeating a strategy from his earlier film Julot der Apache (Joseph Delmont 1921), the massive publicity for Albertini’s character also seems to confirm his own star status. Personally, I thought Rinaldo Rinaldini (Obal 1927), shown on Friday afternoon, was the weakest of the three Albertini films because of its overabundance of intertitles, which especially in the first part of the film tends to irritate. One can see that some scenes are clearly missing while one shot was reduced to a freeze frame. The second half of the film gets better with Albertini’s various stunts inside and outside a huge theatre in Genoa, where several outdoor shots were taken – including a few from the harbour. While in other films Albertini is never shown seminude, here he strips to show his bare chest while performing in the theatre, but stays so in the most part of his flight from the theatre, on to the roof, bending a flag pole, and jumping into a kind of fashion studio. Dutch pianist Daan van den Hurk worked very hard to turn even the most wordy parts of the film in a dashing, dazzling sensation – and well succeeded! In addition to Albertini, on Thursday morning there was the two-part film Helena (Der Raub der Helena/ Der Fall Trojas, Manfred Noa 1924), masterfully accompanied by Günter Buchwald and Frank Bockius. To several avid Giornate-goers this was a challenge, as they just had seen four parts of Henri Fescourt’s Les Misérables the day before, starting from late afternoon till well after midnight. The pristine digitally restored print of Helena, the wonderful special effects, the chariot races and the sea battle in the first part (shot one to two years before Fred Niblo’s Ben Hur!) and the mass choreography and real-sized sets of Troy and the Greek camp in the second part were outstanding. Albert Steinrück’s shift of tragic and superstitious king Priamus becoming a plotting and cruel tyrant matched the character shifts of Vladimir Gaidarow’s Paris from weak to strong to weak to strong etc. And what to think about Carlo Aldini’s bodybuilder Achilles whose violent and almost hysterical pride gets him into trouble, while his bisexuality is expressed in his inability to choose either Helena or Patroclus. Repeatedly stroking Achilles’ arms and legs, Carl/Karel Lamac’s Patroclus must have created quite a stir in those times, especially to those who didn’t know the Illiad. While I had loved to include one or two adventure films with Aldini too (hopefully next year), Helena meant Aldini’s German and internationally breakthrough, and one understands why, especially when watching the second part of the film. Even if he may have been dressed in suits and tails in later films, spectators would always project his physique as Achilles underneath. Mister Radio. Courtesy Österreichisches Filmmuseum. The programme went quite well in written reactions too, as can be read in blogposts by Quinlan (Daria Pomponio), SilentLondon (Pamela Hutchinson), and El Testamento del Doctor Caligari (on Der Unüberwindliche, also a second post on Helena), as well as a large article in the Italian newspaper Il Manifesto. Finally I was interviewed by TV Sloveno for a cultural programme. ~ by Ivo Blom on October 10, 2015. Muchas gracias! Stefan Drossler (Filmmuseum München) mi ha confirmado que este otoño viene el DVD de la pelicula.